-2 doctoral C:egrees. rhen, in 1959-1963, he livee amon g t h e Cusan tribes in North Borneo. He has also traveled extensively among t.he aboriginal areas of Indonesia and the Polynesian Islands. 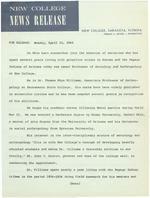 Married and the father of a young son, Dr. Williams was highly recommended by Dr. Margaret Mead, eminent anthropologist. He has been a member of the facul'. :.y of Sacramento State College and the Universit y o California a t Berkeley since 1956, and previous to that was an instruc1:.or at 3yracuse University. his research grants and aca0emic honors Dr. Williams was: undergraduate reac:ler, Miami University; awarded a graouate scholarship, University of Arizona; appointecJ university fellow, Syracuse University; pre-doctoral fellow, l7enner-Gren foundation; awarded research grants from the National Science Foundation, Eli Lilly Foundation, and Joint Committee for Asian Studies. He was selected to give the first annual faculty research lecture at Sacramento State College. He has been elected to Alpha Kappa Delta and Psi Chi. He is a fellow of the American Anthropological Association, American Sociological Society, Pacific Sociological Society, American Association for the Advancement of Science, Society of Sigma Xi and the American Associacion of University Professors. He has writt.en a book on his research in North Borneo which is scheduled for publication this fall hy the Cambridge University Press.